A super storm has recently ravaged the eastern coast of Central America. The Turtles and Col. Blade are on their way to the decimated town of Santa Baloona to help the locals. To get there, they’re travelling in a blimp they absconded with after a team-up adventure in which they defeated Mr. Cadaverous and his Blue Santas. After fishing the cow from “Bonanza” out of a tree, they set down on the roof of the US Embassy and the Ambassador takes Col. Blade aside for a debriefing. They meet with Professor Daub, an archeologist. The Ambassador explains that a unit of the US Military called the I-Team went missing somewhere in the Abecero Peninsula and they need to be found. Col. Blade reconvenes with the Turtles and says that they and Professor Daub are deploying immediately for a special mission. At Mysterymen HQ, following a shrunken head/protein shake/ice cream incident, the team receives a top secret call to arms. Apparently, thousands of years ago, there was a highly advanced, nigh-mythical city called Botaquaxal, hidden in the Abecero Peninsula. It vanished somewhere around 948 AD and all attempted expeditions to locate it ended in tragedy, as the investigators all vanished. Recently, a dentist bought an artifact at a flea market and after x-raying it, found "something". That clue incited the Pentagon to send the I-Team into the Abecero Peninsula. When the super storm hit, it caused an earthquake, revealing a lost city. However, the I-Team’s last transmission wasn’t very hopeful, as the radioman screamed about flaming people burning everyone to death. Flaming Carrot rallies the Mysterymen (Screwball, Bondoman, the Shoveler, Mystic Hand, Mr. 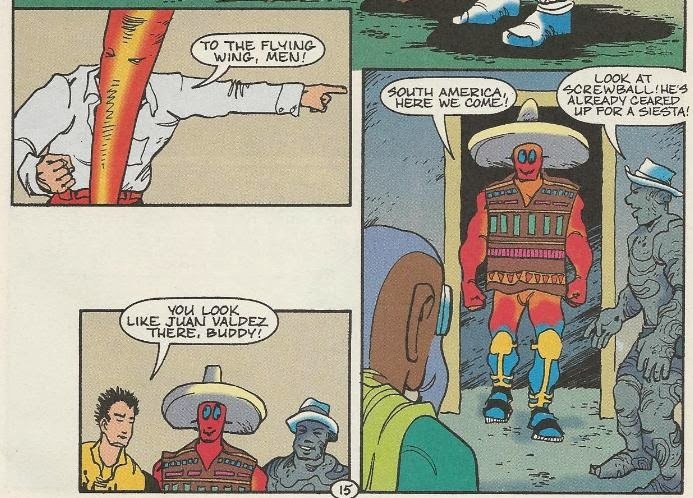 Furious, Star Shark, the Zeke’s and the Spleen) and they take off in their aircraft, the Flying Wing (after donning sombreros suitable for a Central American vacation). As the other Mysterymen take turns flying the Flying Wing, the Shoveler does some meteorological investigation. He determines that the super storm didn’t follow any natural weather patterns but appears to have originated right from the Abecero Peninsula. Via blimp, the Turtles, Col. Blade and the Professor find the I-Team’s campsite (but only after Raph wails on a saxophone he found in a locker). They investigate and find no signs of life, save some meals that appear to have been suddenly abandoned. The surrounding jungle appears likewise abandoned, without any traces of animals. What they DO find are the personal effects of the I-Team (rings, watches, fillings) sitting atop small piles of ashes, indicating they were incinerated almost instantly. Searching, they eventually come across the unearthed city. Oddly, all the ancient buildings appear to be made of a strange plastic substance with magnetic properties. As Mikey skateboards the ruins, he spots a tower jutting out of the sea not far from the coast. Spying through binoculars, Col. Blade notices equipment abandoned outside the entrance to the tower, indicating people had recently been there. They decide to break for pizza and investigate the tower the next day. Sleeping, Mikey has a strange dream about a prospering city, shadowy halls and a flaming man. He’s awoken by Leo’s screaming. Leo exclaims that while he was taking watch, a tiny man made of green flame attacked him. Leo wasn’t lying, as the flaming man pops out of the bushes and attacks again. Leo attempts to cut it in two, but his swords have no effect. Col. Blade pulls out his gun and aims for what looks like a heart in the center of its chest. Blade shoots the heart and the flaming man vanishes. Professor Daub laments that they didn’t try to communicate with the creature. Suddenly, Raph is startled and points to the sky as lights approach. *This story continues in TMNT/Flaming Carrot Crossover #2. *The Turtles last encountered the Flaming Carrot in Flaming Carrot (Vol. 1) #27. *This issue featured an opening editorial by Michael Dooney explaining the origins of this miniseries. Apparently, Burden came up with the idea while doing the first TMNT/Flaming Carrot crossover. It took several years to hammer out the final script, but apparently it was tossed around as two-part black-and-white miniseries, a giant sized annual and a 150-page graphic novel. They eventually settled on the 4-issue color miniseries format. So yeah, as I’ve confessed in the past, I’m really not much of a Flaming Carrot fan, so this 4-issue miniseries isn’t going to be easy for me to get through. Bob Burden’s style of writing relies way too much on just being random for the sake of being random. I’ve heard people call it “stream of consciousness” or “post modernism” and things like that, but to me it just reads like a game of Mad Libs and there’s nothing particularly clever or creative about that. Raph playing the saxophone for two panels because it’s so random. The cow from “Bonanza” makes a cameo because it’s so random. Shrunken head in the protein shake because it’s so random. The issue is just full of stuff like that and after 32 pages, it gets pretty tiresome. 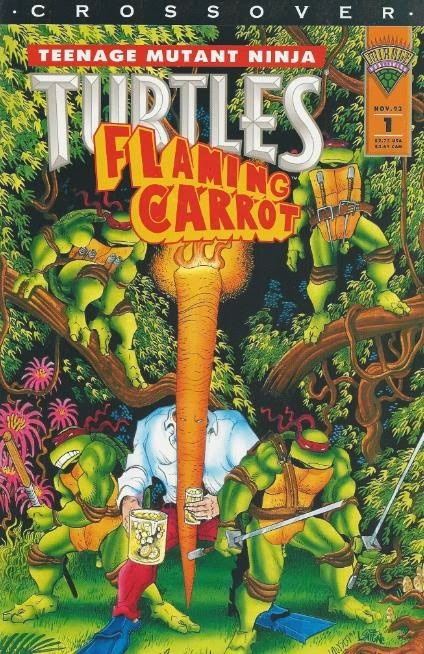 There’s at least a stronger story behind this second TMNT/Flaming Carrot crossover than their first team-up. The fact that an at least semi-coherent plot is necessary to move the miniseries along, the narrative exposition overshadows much of the random nonsense, so it’s a bit easier to digest. As with his last turn at writing the Ninja Turtles, Burden doesn’t appear to understand any of their individual personalities. In fact, I don’t think he’s even aware that the Turtles HAVE individual personalities. They all speak with interchangeable “cowabunga” and “radical, dude” dialogue and never display any of their talents or unique traits. These are the Turtles you would see in merchandising on paper cups or bed sheets during the early ‘90s; vacuous corporate mascots spewing catchphrases and demonstrating no sense of characterization whatsoever. It makes me wonder just why Burden even wanted to do these TMNT crossovers? He clearly wasn’t impressed by the characters because he doesn’t treat the Turtles AS characters. 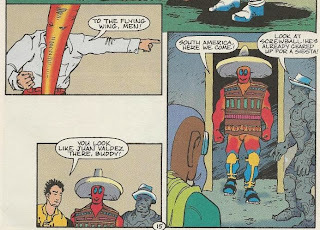 In fact, they’re all so bland and excruciatingly “wacky” that they could be substituted with any given member of the Mysterymen and it wouldn’t change a single thing about this comic. I guess Burden just wanted the extra boost in sales having his name associated with the TMNT during “Turtlemania” would no doubt promise. A lot of guest creators did that back in the day and their contributions can be a pain to sit through. It was just easy money, back then. 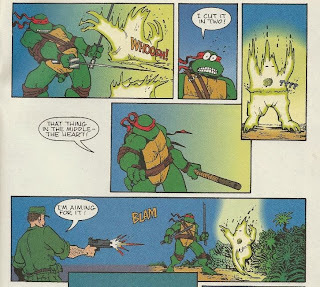 This second TMNT/Flaming Carrot crossover is extremely long and tedious and just not my cup of tea. I know Burden has his fanbase, but no matter how I’ve tried, I just don’t see the appeal in his writing style. It strikes me as being shamefully lazy. You pretty much wrote the same thing as when you reviewed the last crossover. Heh, if you think issue #1 was lazy, then wait till you see the very abrupt art change in the middle of issue #2 ! I also think that Mirage knew what was coming. At least after the first crossover. Probably they really liked Flaming Carrot. So as I can understand if it is not any's cup of tea, I think it is still fair to "reinterpret" the tmnt's characters. Not many guest artists tried to do this in unique ways. Some did. And went really radical, transforming the turtles into their own worlds. The IMO best example is Zulli's Souls Winter take. The turtles don't even have individual names anymore. Nothing about mutation. Everything here is mystical and related to a spiritual state of natural balance. I like to believe that Bob Burden did simply something similar. He reinterpreted the turtles into his weird super hero universe. Just as you said, you could exchange the tmnt with the mystery men staff. But they are the turtles never the less. They are ninjas and big turtles, they like pizza and are radical. This WAS the mainstream formula of the turtles at their height of popularity (at least in Europe!). For me personally there are also always entertaining and fun parts and for sure I enjoyed the art in this series.